Here’s what frustrated patients often say when describing their Runner’s Knee pain: “I’m getting a pain around my knee cap when I run. It’s been getting worse, and now it even hurts when I walk upstairs.” Does this sound familiar? In this article, I’ll explain what’s causing your knee injury and outline the simple changes you should make to fix it. Let me start by explaining what’s going on. The most important thing to know is that there’s nothing permanently damaged in your knee. The pain you’re feeling is coming from irritated (not damaged) bones and soft tissues behind your kneecap. Researchers think this irritation is caused by the way your kneecap glides up and down your knee. They’ve found that in many people the kneecap sits on a skewed angle. So, when you bend your knee it tracks slightly off center and rubs against the side of your knee. In day to day life this doesn’t bother you because its normal for your body. You’ve grown up with these knees and your body has adapted to your kneecap’s movement. The trouble comes when you put excessive load on your knees beyond what your body can handle. When you go past this point, you get injured. This limit is called your injury threshold. Everybody has an injury threshold. Your injury threshold is determined by lots of factors including your genetics, bone structure, strength and fitness. For example, if you are a novice runner with previous injuries, your injury threshold will be lower than that of a younger, seasoned, long-distance runner. Unfortunately, the structure of your kneecaps can lower your injury threshold and increase your risk of injury. The bad news is you can’t fix the structure of your kneecaps or how they glide. The good news is you don’t have to. Your kneecaps are just one factor affecting your injury. It is possible to run pain free with imperfect kneecaps – many people do! To fix Runner’s Knee you have two options: you can either lower the physical and internal stress OR increase the threshold. Or even better, do both. But, the first step is always settling the pain. If you’re already injured, you’ll need to settle inflammation before you do anything else. 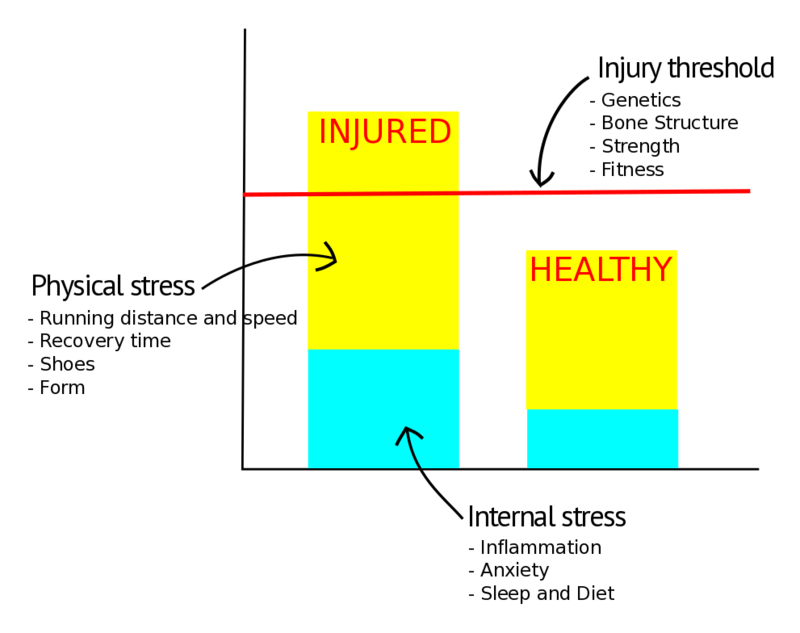 Inflammation keeps your internal stress level high and it means you’re constantly close to that injury threshold. This is the body’s protective mechanism, but it leaves little room for physical stressors like running. It’s also why insignificant activities like walking upstairs suddenly hurt. Find what works for you and use it. The quicker you settle the inflammation, the happier you’ll be. If you’ve tried these things and they aren’t helping you should consult with your physio or sports medicine doctor about your other options. Settling inflammation will get you under the injury threshold and pain free. But, if you want to keep running you’ll need to raise the threshold and monitor your (training) stress better. Runner’s Knee usually starts when a runner changes something in their routine. For new runners, this is particularly risky because EVERYTHING is new. Muscles, tendons and bones take a long time to strengthen and adapt to the strains of running. Much longer than your lungs and heart to build cardiovascular fitness. Similarly, if you’re a seasoned runner but are training to beat a new milestone, you may be adding load quicker than your body can handle. Many running coaches and Physiotherapists recommend the 10% rule: only increasing distance by 10% each week. This rule isn’t perfect. There are people who can increase far more and be fine. Others will struggle to increase by 5%. Lots of individual factors affect this number, but it’s a good general guide to start with. Remember your injury threshold is set at a certain level. If you push yourself too much and don’t give your body time to adjust, you’ll simply hit that limit and be forced to deal with inflammation and injury. Recovery time is vital to building strong and healthy tissues. During exercise your muscles, bones and tendons are placed under unusual stress and undergo tiny tissue breakdowns. This is a good thing! These micro-injuries stimulate your body to regenerate stronger tissues and be better prepared for next time. Recovery usually takes between 24-48 hours, but it could be longer if the activity was especially straining. You need to give your body a chance to get stronger before you load it again otherwise your tissues will break down even further, eventually leading to larger injuries. The repetitiveness of running is the reason so many people get injured. Loading the same tissues over and over again doesn’t allow your body time to rest and rebuild. As a result, you hit the injury threshold quickly and have to take 3 steps back in order to recover. Smarter training factors on recovery time. This doesn’t mean you sit on the couch eating pizza. The best recovery is simply changing the area of stress. You can do this by adding variety to your routine – play a sport, swim, cycle or go to the gym. You will be a better, less-injured runner for it. You can also raise your injury threshold and fix Runner’s Knee by becoming stronger. Strong muscles absorb more force and reduce impact on your joints. There will be less stress your kneecaps and you’ll be able to run much further without pain. The most important muscles to focus on are your glute medius and miniumus (around your hips), your hamstrings (back of your legs), and your VMO (above your knees). These muscles are the key supporters for good running gait. Don’t be afraid to hit the weights. Your strengthening program should be challenging and progressive. Just like in your running training, you want to see improvement over time. Many runners incorrectly believe weight training will slow them down. The truth is, stronger muscles are more efficient and will help you run better for longer. Bad shoes will cause excess stress and may be part of the reason your knee hurts. However, shoes are never the sole reason (pun intended) for knee pain. It is much more important to firstly look at your training routine before changing shoes. Let’s take a minute to look at what the research tells us about running shoes. Matching shoes to foot type doesn’t seem to reduce injuries at all. This is because your foot motion remains the same in all shoes. If your arch drops when your foot lands, it will continue doing so even in shoes that have ‘arch support’. So, what you should look for instead are well-made shoes that feel comfortable. Try lots of pairs, ignore the marketing hoo-ha, and select shoes that feel great on you. Although you shouldn’t worry too much about the style of shoes, you should worry if you only run with one pair. 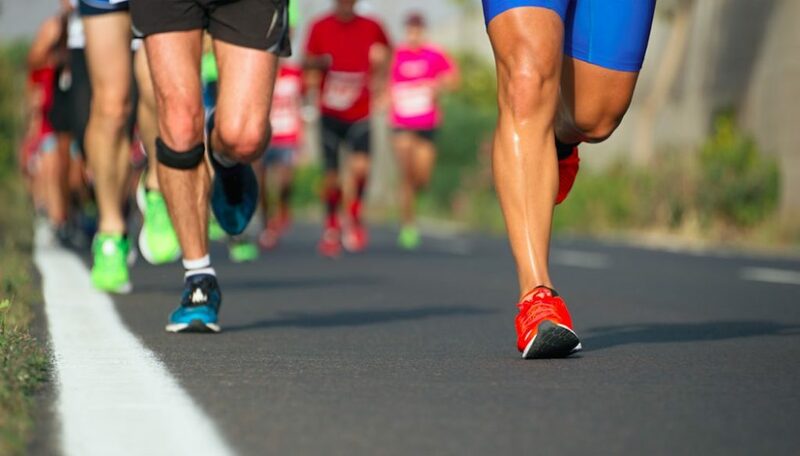 A 2015 study published in the Scandinavian Journal Of Sports Medicine showed that runners who regularly switched between 2 or 3 shoes were significantly less likely to get injured. Variety in footwear takes away some of that repetitive stress on your body. You will use your muscles slightly differently and feel new pressure points when you rotate shoes. Are we natural born runners, or is it a skill we need to master? You will find passionate people on both sides of the argument, but this is what we know for sure. Everybody runs slightly differently and there are many examples of professional athletes who have terrible form but continue to run fast, and pain free. Does that mean form doesn’t matter? Well, not exactly. Although over time your body will adapt to your running style (just like it adapts to your kneecap movements) there are things you can change to reduce the overall stress on your joints. Remember more stress = closer to injury. Start by simply taking more steps per minute. This is called cadence, and studies suggest that increasing this number by just 10% significantly reduces your injury risk. You can also get a physio to do a comprehensive gait assessment. They will record you running and closely look at lots of key parameters. This can be an interesting insight and will give you things you can work on. It’s important to note that any sudden change will be stressful to your body. So even if you need to change your gait do it slowly and gradually. Give your body time to adapt. My hope is that after reading this article you have a better understanding of your injury and know what you need to do it fix Runner’s Knee.